Peaches. We love them. And when the nearby orchard has thousands of them growing on trees, ripe for the picking, we buy them by the bucket load. 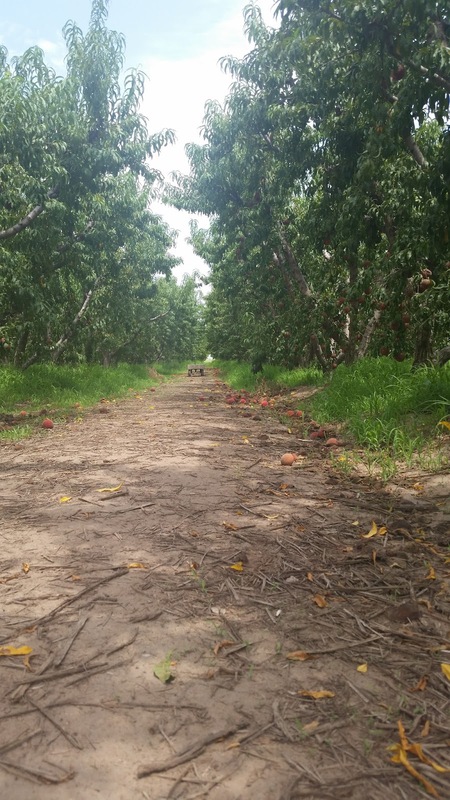 Last month we took a little road trip over to Apple Annie's and we entered tree ripened peaches paradise. We've been going here for years. We used to live a little closer and would go for peach season and apple/pumpkin fall harvest time. But now, we usually only make it once a year. Peach season wins! 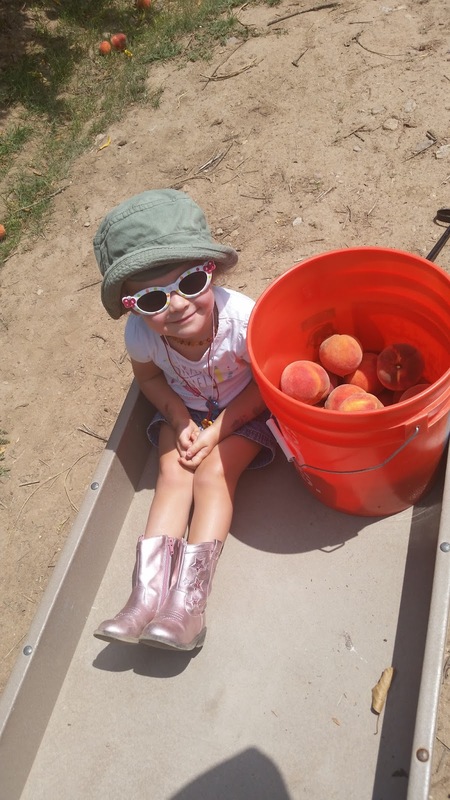 Who's ready to pick peaches? their first Apple Annie's experience. The girls had a blast running along the rows, dodging fallen fruit, watching giant beetles feasting away on the juicy flesh. They helped pick fruit from the lower branches and were great assistants at placing them gently into the buckets. Even though we were under the tree foliage canopy that protected us from the sun's rays, it definitely did not stop the heat. Two buckets were filled to the brim and the girls had had enough. 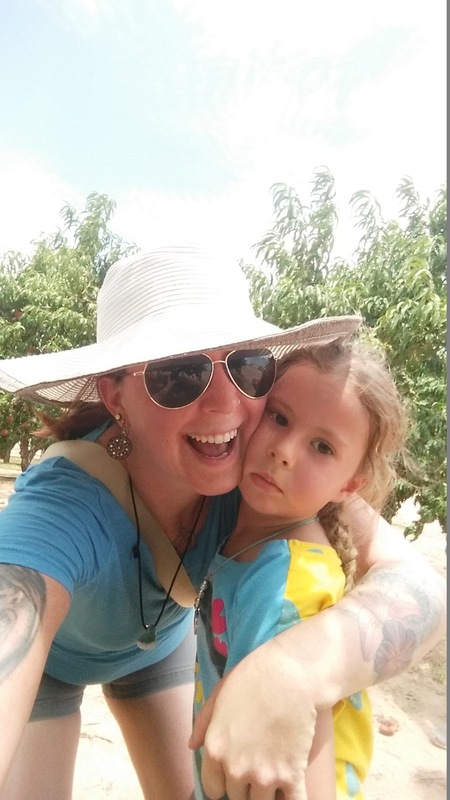 In keeping with tradition, we paid for our bounty and then enjoyed our packed lunch under the shaded patio that looks out over the orchard. Afterwards, we bought a slice of pie and a heaping scoop of ice cream. 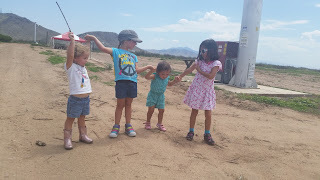 We loaded up the truck with peaches and kids, parted ways with our friends, and headed home. Only for the AC to give us issues. Again. In high 90s temperature, we had to drive on the highway with windows down. For an hour and a half. If we weren't sweaty before, we surely were now. As soon as we arrived at the house and unloaded the peaches, I began washing and prepping them. Of course, some were devoured right then and there. There's nothing better than a sweet, juicy peach picked straight from the tree. With your own hands. Violet's 1st solid food taste was a peach right off the tree while we were at the farm a couple years ago. I normally make a crisp or two to freeze and then freeze bags of sliced peaches. They are divine to thaw and bite into in the middle of winter. I can't even explain how amazing they taste. I'm instantly transported back to the hot summer days. This time I decided to be adventurous with the peach usage. Considering the fact that we are trying to sell the house, I shouldn't FILL the freezer with prepped food. 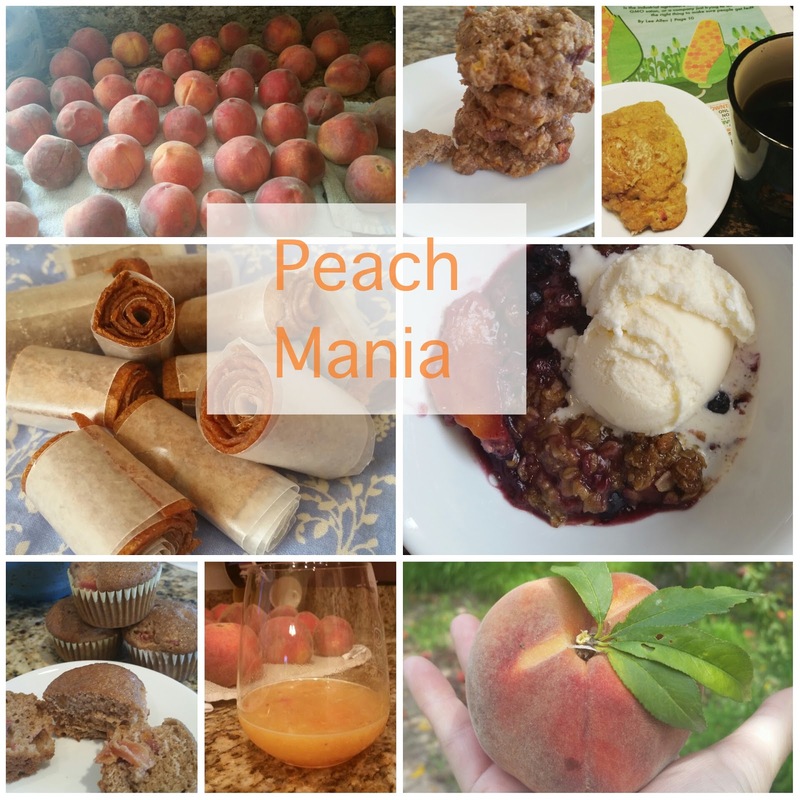 I found recipes on Pinterest, took recommendations from friends and froze a dozen bags of chopped or sliced peaches as well. Here is the list of recipes that I used. They were all so delicious. -Peach, Blueberry, Basil Crisp from How Sweet it is. Basil? I was skeptical too but this recipe came highly recommended by a friend. I've never thought of using basil in anything other than savory food. It added an extra fresh, summery punch to the dish. It had my taste buds confused but delighted. -Peach Pie Oatmeal Cookies from Amy's Healthy Baking. These little nuggets of goodness are bursting with flavor! 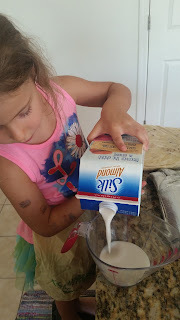 They are made with almond extract instead of the normal vanilla in most cookies. I substituted maple syrup for the honey called for in the recipe, because that's all that I had. I'm not sure if the recipe intended to or not, because it didn't specify, but I left the skins on the peaches and it turned out superbly. These cookies were so moist, packed full of flavor, not too sweet or filling and chocked full of tidbits of peach. I doubled this recipe. I normally freeze a portion of a batch that I bake, but these were such a favorite that they never even stood a chance. -Peach Muffins from Food.com. I used half whole wheat, half all purpose flour, and omitted the almonds from the recipe. I'd love to try them with, but Jeff is weird about nuts in his food and considering I need him to devour a large portion of what I bake, these were sans nuts. I made a mix of regular size and mini muffins and was able to freeze a gallon freezer bag full of them. These have proven to be easy breakfasts as they are not too sweet and are easy to pop out individually. -Peach Fruit Leather from Weelicious. I have been meaning to make fruit leathers from scratch for a very long time but have never gotten around to it. The thought of having the oven on for so long has been a deterring factor. But the oven is set so low that I didn't even notice it was on. These came out a little crisp along the edges of the pan but softened after sitting for a while. I rolled them up on strips of parchment paper, sealed with a tab of tape and stored them in a Tupperware in the pantry. The kids (and I) adored these. Even better that they only contained fresh peaches and raw, local honey. Nothing less, nothing more. I attempted a 2nd batch using peaches and raspberries but even after a LOT of extra time in the oven, they just wouldn't set. I was a little bummed at the waste of fruit. -Upside-Down Peach Cake from Taste of Home. Oh. My. Goodness! How in the world have I never had peach upside-down cake? Why does pineapple get to steal the spotlight in the upside-down cake world? This was SO good. I'll be making it again. I used almondmilk in place of regular milk called for in the recipe. There are no pics of this because it didn't last long enough. -Pureed Peaches in White Wine. Next time I won't use skin on the fruit. It was a little too chunky but it did the job while I was baking. -Peach Raspberry Crisp. I don't use a recipe for this. I just use some concoction of oats, brown sugar, cinnamon and butter,or coconut oil, as a topping. Sweet. Tart. You can't go wrong. 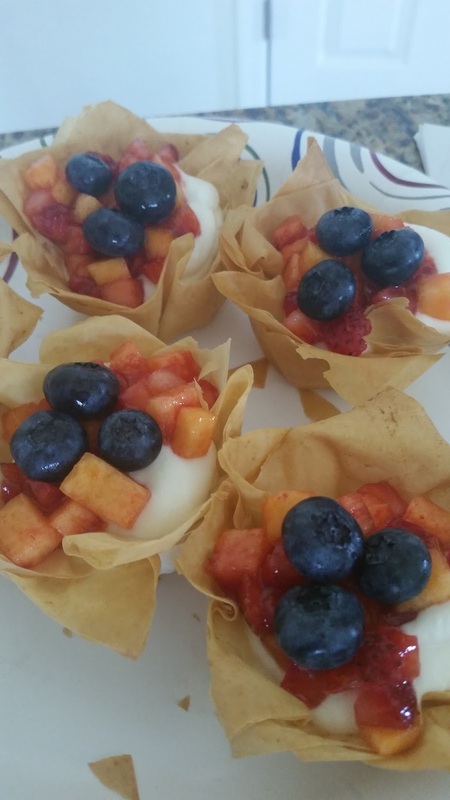 -Peach, Strawberry, Blueberry Cups. My neighbor dropped these little beauties off to us. The fruit sits atop a concoction of cream cheese, homemade whipped cream and powdered sugar and is piled into cups made from Phyllo dough or wrappers? I'm not sure. The cream cheese mix is barely sweet which makes the whole thing light and fresh. Spending hours on my feet, hands covered in fruit, cooking, cutting, mixing, is always a daunting task but the satisfaction of seeing the fruit go from tree to mouth is priceless. What's your favorite peach recipe?